i thought it was about time i showed some outfits that aren't just dresses, so here's one i wore to work recently. 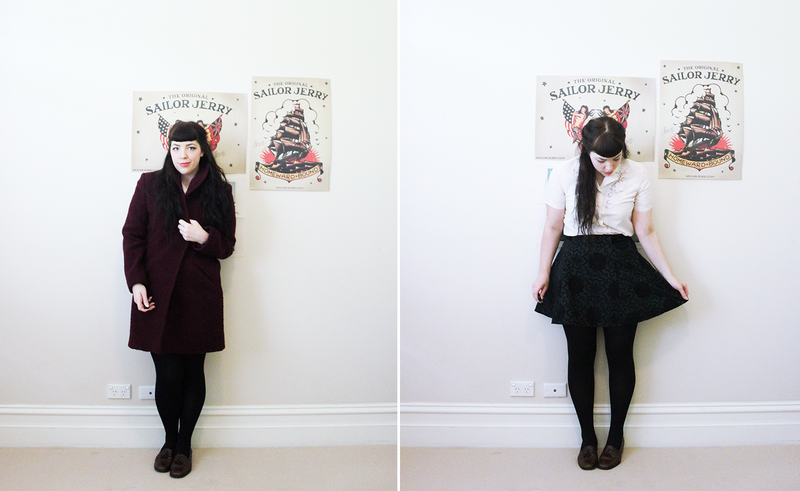 i found the burgundy coat op-shopping a few weekends ago and it's so warm! i think buying vintage/from op-shops is the best way to stock up on nice winter coats, they can be so expensive to buy new and i like to have several to choose from so i'm not wearing the same black or red one every day during the winter months. i also don't think that sizing is too important since coats are almost never form-fitting so if you find a great one that's a size or two too big it just means you can fit a cardigan or jumper underneath it. 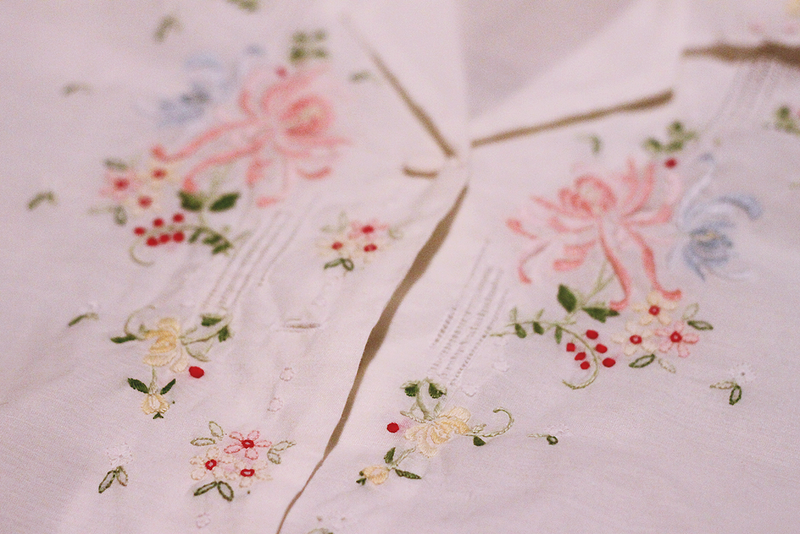 i think blouses like this one are so, SO pretty. i have one other that's also cream but with pastel flowers embroidered on it and i actually found two more in a vintage shop this weekend in baby blue and baby pink. i don't know if they're a particular style that has a name (help me out if you know, vintage ladies) but i think they look so delicate and sweet and they're some of my absolute favourites. the handbag is one my mum bought for my grandma when we were in paris in 2004 and i've now adopted it along with some of her shoes and lots of her pretty scarves and hand-knitted jumpers. it doesn't look very big but surprisingly it can fit everything i need and it keeps it all in its right place as well so i can actually find my lipstick or keys when i need them (i'm looking at you, tote bags). I love those type of blouses too! They just go with everything. Looking stunning! I know how you feel, I always tend to only wear dresses! They're so fancy and flattering and easy to style, It makes me wonder how can anyone not love them... I can't remeber the last time I wore pants. Can relate to never finding anything in my totes either, so bloody frustrating! You look lovely, as always, my dear :) The embroidery on the shirt is awesome! neither can i! i hardly ever wear them, i just find dresses and skirts so much more flattering and comfortable and versatile. Haha I struggle to put together an outfit that isn't just a dress and tights and a cardigan. 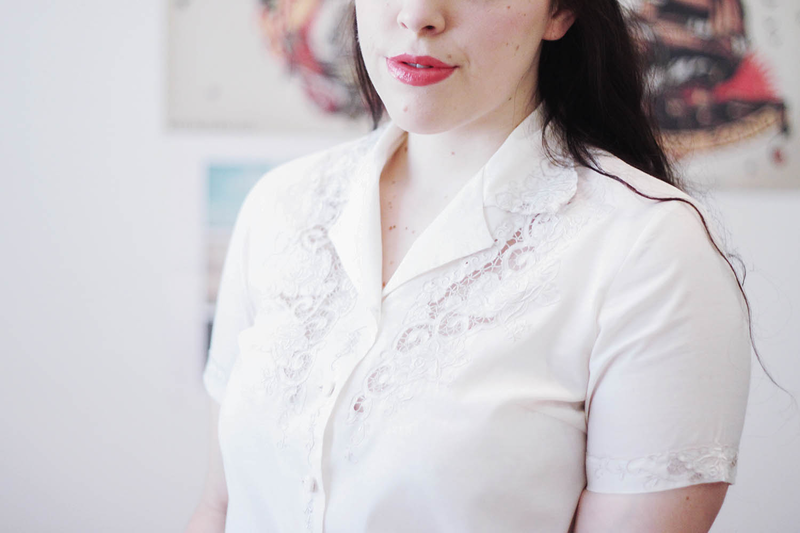 Tops and bottoms are so complicated, and I think I need more cute blouses like your one(s) to make life easier. It is really sweet that you've adopted some of your grandma's clothes too. Also I love how you take photos indoors, and I think I need to get a tripod so I can copy you. So many outfits, so little time. always so many outfits, never any time! some days my separates come together into an outfit i like really easily and other days i get so frustrated and that's exactly why i only buy perfect dresses so i can just throw on one of them and be done with it. Your blouse is so lovely! The delicate details on it are subtle and pretty. I really need to check out coats in secondhand stores. I'd like to find a nice camel coat, but buying one new is so expensive! Thrifting coats seems to be the way to go. definitely look around for second hand ones, that's how i've found some coats that i really love in colours i probably wouldn't commit to if i was paying full price, but it really expands your wardobe a lot. 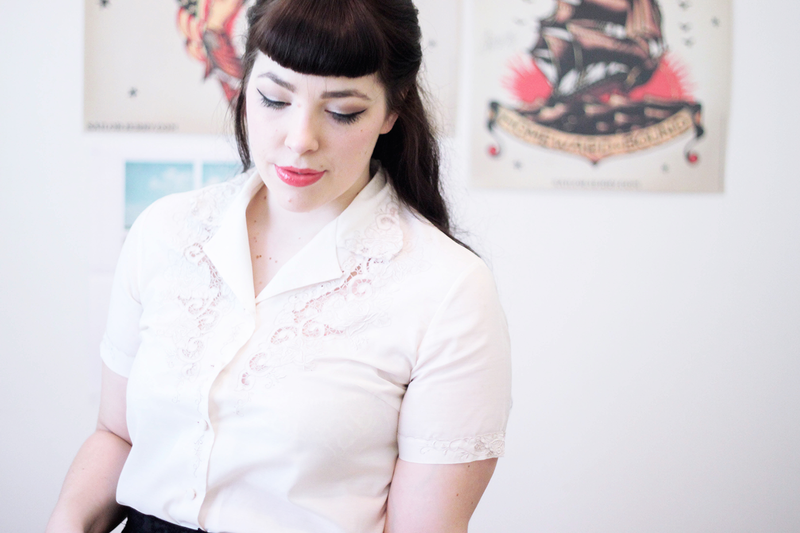 Vintage blouses are what I'm currently on the hunt for. I love your dreamy cream one, but unfortunately I don't do well with the whites and creams. I need to find a few in a bit of a deeper color and that is a challenge for me. Your header is so pretty! You also look beautiful! Loved your blog and will come back for sure! 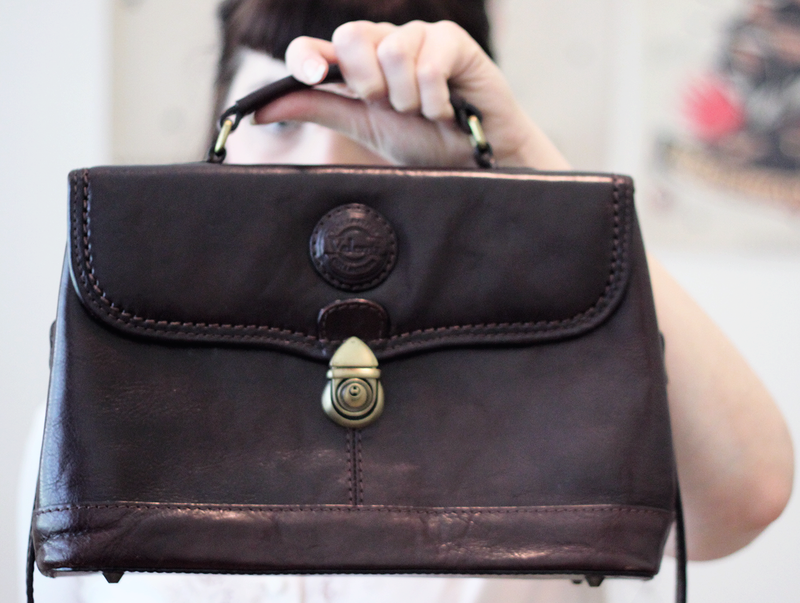 This blouse and this bag are both so darling! Such great pieces that go with everything. I can't believe I JUST found your blog, I'm in love! so lovely! blouse is amazing! This is such a gorgeous outfit! You certainly do know how to style an outfit well. :) I'm really looking forward to starting my internship where I can where anything I want to work too. Such a sweet perk of working in the creative industry, right? I'll definitely be able to give more love to my clothes, though I hope I don't get sick of them and then tempted to buy more, haha. I've actually never been op shopping before and I really want to try it someday! I feel like I'd need to go with someone who's clued up because I honestly have no idea where to shop or how to spot a really nice piece. It's always kind of scared me for some reason. I'm sure Sydney has some lovely vintage stores, Perth just really has nothing, haha. Ohh you have so many pretty things! 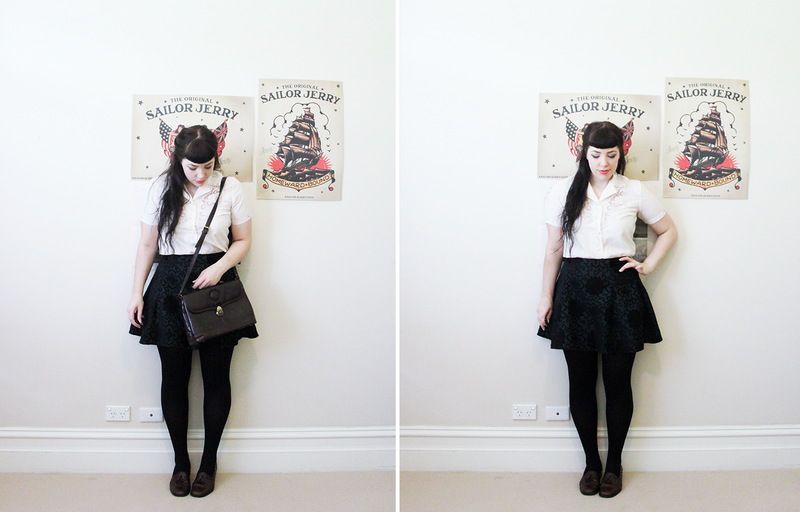 One thing I definitely need more of is separates, I'd love some more blouses and skirts! 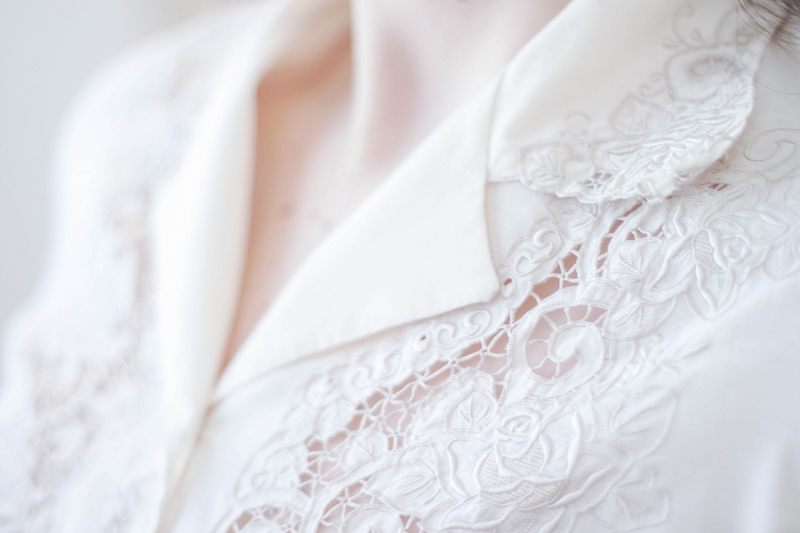 The lace work on your blouse is so beautiful and dreamy. I don't know what it is but all of you Sydney and Melbourne girls have such great op shop luck! your hair! your hair, your hair. and that top is gorgeous as well. I find that I have a few too many white tops with little crocheted or lacy details, but they are so perfect I can't get rid of them! aww thank you! i have SO many white shirts i've picked up from charity shops it's not funny, i need to cull my collection down to the best ones and get rid of the ones i never wear. That blouse is so very, terrifically lovely. It channels the sweetest elements of a cotton lace doily (I say that as a wholly positive thing) combined with the spirit of certain vintage wedding dresses. I love how your dark locks further help it's pale, delicate hue stand out. The contrast is strikingly beautiful. Amazing blouse. Black skirt and a blouse is always my uniform. definitely have a look around for second hand ones, the new ones in shops are so expensive and i'd much rather have a few to choose from! it's get so old wearing the same one every day. these blouses are so nice and they look terrific on you! i love everything lace and cutout! they can be anything from the 50s to the 80s... vintage is always better than new in my book he he. lovely blog btw!